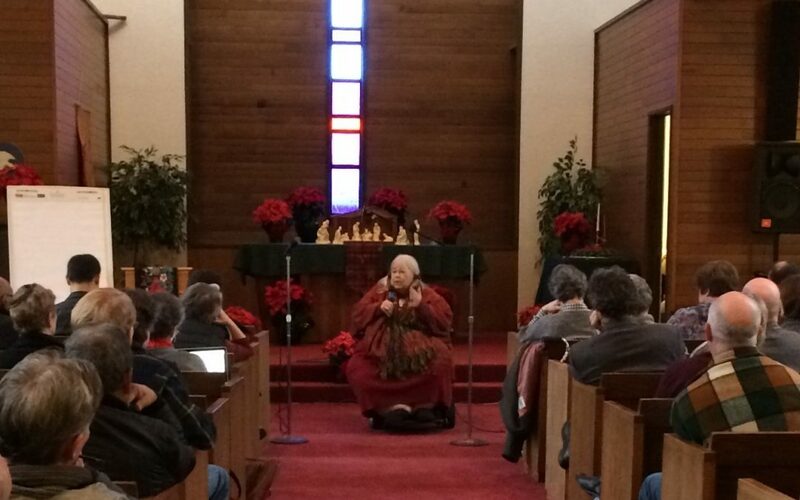 On Friday, December 2nd, over 100 faith leaders from Christian, Jewish, Muslim, Unitarian and Buddhist traditions gathered at the Church Council of Greater Seattle to develop collective responses of hospitality, refuge and protection for communities under threat of deportation, hate and violence. We heard from Arsalan Burkhari from the Council on American Islamic Relations (CAIR-WA), Aneelah Afzali from the Muslim Association of Puget Sound (MAPS), Mozart Guerrier from 21 Progress, and Dianne Aid from St. Matthew – San Mateo Episcopal Church in Auburn, and the Church Council of Greater Seattle’s Executive Director, Michael Ramos. Four groups formed to consider: faith-based sanctuary, circles of protection, policies and advocacy, and prayer and worship. There is much energy to come together and be a faithful presence in accompanying and standing together with communities at risk, in light of the likely implementation of federal measures that could damage the fabric of these communities. Looking for ways to respond? Below are links to some resources and action items shared at the December 2nd meeting, along with some additional background information. They will be added onto as more information arrives, and can also be found under the resources and calendar sections of our website. If you’d like to be involved in any of the four areas (faith-based sanctuary, circles of protection, policies and advocacy, and prayer and worship) locally, email Ann or call (206) 525-1213 ext. 105. Or connect nationally via Church World Service. Combating Islamophobia Action and Resource List – Our Muslim partners have shared with us this list of ways to support them and combat Islamophobia. The list includes resources for educating oneself about Islam, local Islamic organizations, and ideas for being an active ally. Please share! Declaring Washington a Hate Free State press conference Monday, December 19 from 9:30 a.m. – 10:30 a.m. at Seattle Center Pavilion, 305 Harrison St., Seattle. Save the date: Friday, January 20. Plans are being made for two separate events: a march and an interfaith service. The interfaith service, Sabbath of Dreams: The Hard Won and the Yet-to-be, will be at 6 p.m. at Temple De Hirsch Sinai. More details to come for both events.